With the FIFA knockouts having gotten over, now is the time for the diehard soccer fans to remain glued to the television set, it has become a see or die situation for the most ardent fans. Nobody wants to miss out on any game or goal scored by the favourite players. The football fervour is at its peak. What a football fan will do to watch his favourite team play live in a stadium is something that only a soccer fan can relate to. Since it as an era of smart phones with apps and soccer both trending, the former being a permanent contender in smart phone trends, let us look into the top five apps that are a must have for all the soccer fans out there. This is a devoted app for sports with live updates, match schedule, scores and integrated radio. Along with the match update one could also listen to the live commentary. This app has a notification feature which enables the user to set match alerts for various teams for line ups, kick-off, goals, half time score and results. One could also customise the app by setting a quick link for their favourite team to get faster access. This App is available for both Android and IOS phones. 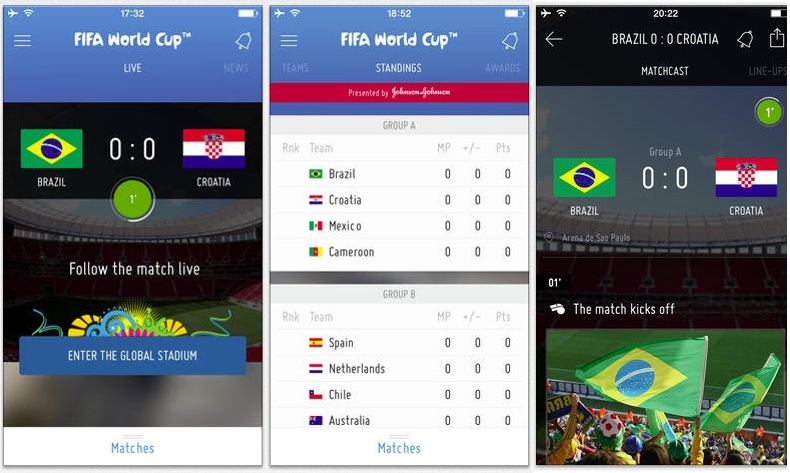 This app is designed and managed by the FIFA team, it is the official app. It not only updates the live scores but also enables one to experience the live commentary which is even better. This App features the match schedule along with the name of the cities where the same is being played. To enhance user experience it has contests where in one can predict the match result and try out their luck. The FIFA APP users also have a chance to win Kick of ball from the matches, now how amazing is that? This app is available for both Android and IOS phones. So without wasting any more time install FIFA OFFICIAL APP and get ready to kick the ball. This App is available for both Android and IOS users. This app has a very clean design, divided into sections for scores, news and twitter updates. They also have a notification feature which requires sign up. This app is user friendly and the twitter updates provide the latest trends in the soccer world. This App is preferred because of its clean interface and neat classification of various sections. The special quality in this app is that it is available for Android, IOS and Windows phones. It has live commentary, latest news and sports update. They also have a notification feature which can be customised. It features videos from press conferences and interviews, and also has a comprehensive match schedule. This app ensures that you do not miss even a second of the game and one can also have a live chat with other football fans out there and share the animation of the game with them. If you have a fetish for collecting football stickers then this app is made for you. They have a collection of stickers to choose from, you can also exchange stickers with other friends to complete your collection. You can swap your stickers with football fans all over the globe. One is provided with a Magazine to stick these stickers. You can also create groups or join some to increase your collection. Complete the collection and enjoy the 50 main prizes and 200 runners up prizes which can be won by anyone. This App is available for both Android and IOS. So all the best and stick the kick. These Apps will definitely take your soccer experience to a completely different level since it not only enables you to view the match scores and live updates but also gives you an opportunity to interact with Football fans all over the world which exhilarates your football fervour.